(Newser) – A famous auction house must give up the name of the buyer who tried to pay $14.5 million for a rare idol the Turkish government claims was illegally taken from the country, a judge ruled Wednesday. 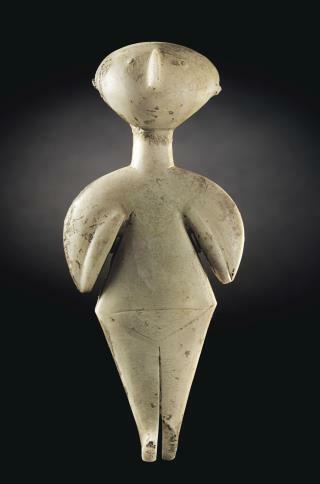 According to Christie's, the 9-inch Guennol Stargazer comes from the Chalcolithic period between 3000BC and 2200BC and is one of about 15 such complete idols in existence. "The Guennol Stargazer is an iconic work of art and universally recognized as the finest Kiliya idol in existence," the auction house's head of antiquities says. Back in April, an anonymous buyer agreed to pay $14.5 million for the idol at auction. The next day, the Turkish government filed a lawsuit demanding the return of the idol and the would-be buyer's name, Courthouse News reports. Maybe it's the Hobby Lobby people. Funny how Turkey calls it part of their patrimony when it's an idol of a female. Turkey should be given the item back immediately. It belongs to the socialist goverment and citizens.